How are we resilient when life seems to give us a swift kick? How do we just shrug off difficulty when our hearts are hurting? How do we hold on, so we don’t get lost in the hard seasons? Whether it’s living beyond the divorce, walking through infertility, enduring ANOTHER deployment, recent illness, or any other personal challenge, how we respond to these hard seasons expose the condition of our hearts. Cultivating relisience in the hard seasons can help us move forward in healthy ways. So let’s talk about what that looks like in our everyday lives. Do you have a circle? You know, those women who will fight for you, pray for you, meet you at the altar, cry with you, bring you cookies and watch tv in their PJs with you women. The kind of women who will cheer you on when you are blessed and believe God’s best for you when you walk through the winter seasons of life. The kind of women who will step into your darkness, hold your hand, and are not scared of the messy places of life. Cultivating healthy, supportive friendships provide support, encouragement, love, and hope when you want to walk away from what God has called you to do. These friendships remind you of God’s promises and hold you accountable for walking boldly in Christ. Together we are stronger. Together we are braver. We are better together. So let those women in your life. Let them in your mess. Pain has a way of wanting to isolate you, keep you in your pain, and feed you lies no one understands. But love draws you in. Use your voice and let others know how to help you, love you and be there for you. Too often in hard seasons, we can spend too much time, and effort focused on the bad. We speak more about the illness than how we are living our lives. We talk more about what our husbands are not doing. We complain about how the kids don’t listen. Venomous words spew out of our mouths seeking to poison anyone who will listen. This negative talk will not sustain you in the difficult moments. Quite the opposite. All those complaints will drain you of your energy, steal your joy and rob you of your peace. Tell that negative committee hosting tea inside your head the meeting is adjourned. Your current situation will no longer sway your thoughts. Those negative thoughts about the challenges in your marriage, with your kids or on your job are going to be replaced with words of praise to God. His word is your truth. Choose today to praise Him. While you are in this hard season, keep a gratitude log. Every day remind yourself of the promises and blessings of God. Only His word and His truth will help strengthen you to build the resiliency you will need to walk through this hard season. 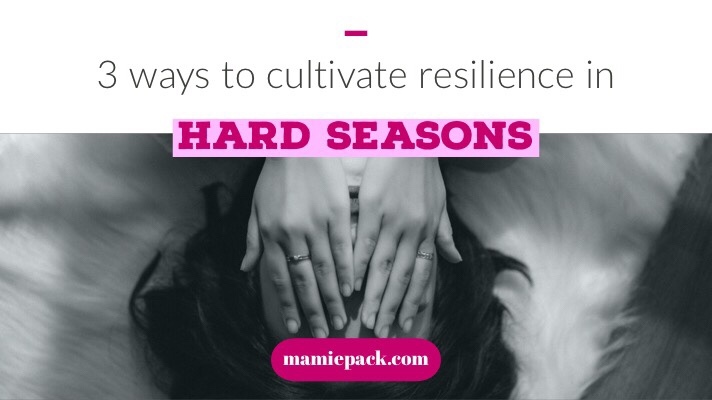 How you cultivate resilience in the hard season has a lot to do with how you take care of YOU! So guess what? Your body needs proper sleep and exercise. Put that phone down. Stop scrolling late at night. If you are going to be up, get in your Bible and do something productive. During this time, pay attention to your own needs and feelings being aware of when you need additional care. One of the worst steps women make during hard seasons is to stop taking care of their bodies. We stop exercising and indulge in food for comfort. Self-care is about more than bubble baths and pleasant walks. Self-care is doing the hard thing for yourself when it is not convenient. Do the meal prep. Go for a walk. The increased stress which usually accompanies challenging seasons can be prevented by deliberate decisions to take care of you. Engage in activities you enjoy, and you find relaxing. Put it on your calendar and protect that time. You matter! I love “attitude of gratitude.” Thank you for this uplifting post. It is such a great reminder. This too shall pass. Such a great attitude to have, right? Love your gratitude prompt log! will have to incorporate those into my nightly writing! Yay! Glad to hear it. Do you use anything in particular for your nightly writing? This is a great post, especially the gratitude log. I’ve saved that image to my phone. Thanks! Yay!!!! Let me know if you add anything to it. We have had a tough two years after my husband lost his job so we have had to dig deep! All of the are such valid points! Thanks for sharing! In the hard seasons digging deep can be an understatement, but good for you that you are! Care in the bad as if it is punishment for not being able to do it all. Doing small things like reading, resting, meditating all help. Cultivating those friendships are so important! We moved 2 states away last year and rebuilding a new community has been difficult but so important for me. We are a military family, so moving is all too familiar. It takes time and intentionality to build community. Good for you for stepping out! Yes it does Flossie! That attitude of gratitude changes our entire posture toward our life situations. A reminder to look for the blessing and be thankful is a reminder we always need even more so in the hard days. Absolutely Crystal! There is some good even on the hardest days. I so agree with culitvating health friendships. It’s so vital to surviving seasons of suffering. Oh, yes. It is so important.